“Where are all of the Zambian banks, the Zambian insurance companies, the Zambian suppliers?” That’s the question Monica Musonda’s Nigerian boss asked her when they traveled to Zambia, her home country, to set up a new cement plant. That reflection sparked the idea of creating her own business. She knew she wanted to create a Zambian brand and eventually decided to starting a food company, Java Foods. Everywhere in the world entrepreneurs face challenges starting up businesses. But in Africa, there is often an extra layer of hurdles, what Monica calls “sprinklings of the Africa factor.” One such challenge is finding, and affording, expert technical and business assistance. Monica found that critical expertise through Partners in Food Solutions (PFS), a consortium of leading global food companies that include General Mills, Cargill, DSM, Bühler, Hershey and Ardent Mills. Clients like Java Foods are provided personalized consulting services by corporate employee ex-perts who are empowered to volunteer their time remotely - but directly - advising small and growing African food processors. The services provided are based on what the entrepreneurs defines as their greatest needs. In 2012 when Monica first started her company, she contracted with a noodle manufacturer in China to make packaged instant noodles under her own brand. Four years later when she decided to expand her product line, and locally source and manufacture a fortified instant cereal in Zambia, technical and business challenges started to surface. This is where Partners in Food Solutions plays a critical role in helping small businesses begin to scale. Over the course of a year, PFS paired Java Foods with a team of volunteer food scientists, engineers and business managers from General Mills and Cargill on several projects to get the plant up and running. Projects included Good Manufacturing Practices protocol, processing design and product formulation. PFS Volunteer Scott Myers found a willing and motivated partner in Java’s production manager Farayi Muzofa. “Farayi was a lot of fun to work with, he just soaked up information. I would mention, as you are putting a new line together you are going to have to be careful of x, y and z, and he would want to dive right into that and wanted to understand more” Scott said. Partners in Food Solutions partner in East and Southern Africa, TechnoServe, has estimated that services provided to Java Foods by PFS volunteers are worth the equivalent of US $50,000. But the value of these services goes far beyond a dollar amount. As Monica found in Zambia, the middle link of the food value chain in many African countries, namely the local processing industry, is weak or missing altogether. Strengthening this link can have a significant ripple effect throughout the local economy. More robust local processors can offer a stable market for crops from small farmers, create demand for many other goods and services, and drive job creation - both directly and indirectly. “PFS represents a unique opportunity for companies to leverage the core business knowledge of their employees to really make a difference on the issue of food insecurity in Africa.” says Jeff Dykstra, Partners in Food Solutions’ CEO. 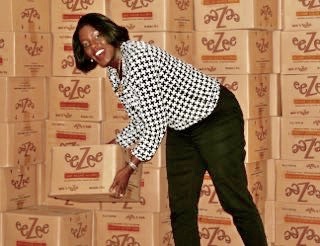 Today, Java Foods has 19 full-time employees, and in addition to its top-selling eeZee Instant Noodles, Java Foods sells locally sourced, locally manufactured eeZee Supa Cereal, a fortified instant cereal.